Made in The Shade Saskatoon offer their clients an amazing selection at outstanding value..it is no wonder they have such happy clients. Let them help you with all of your Saskatoon Window Covering needs! 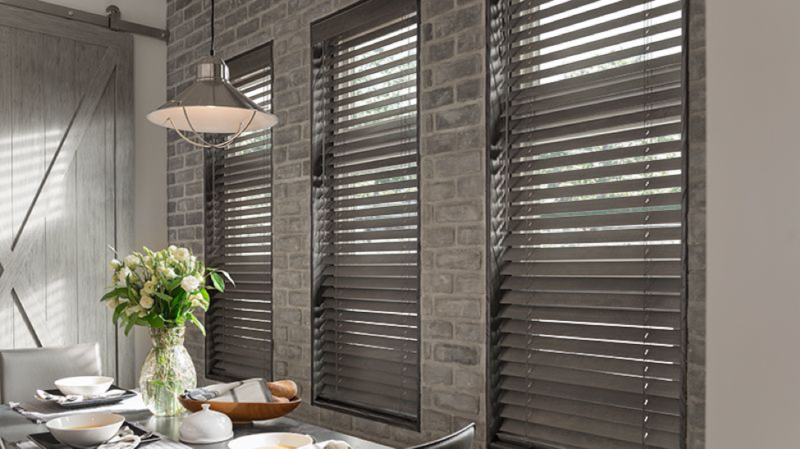 One of the most commonly asked questions in our industry is: What is the difference between faux wood vs real wood blinds? The best answer we can offer involves educating our clients on the features and benefits of both selections. Our horizontal faux wood blind collections give you the best of both worlds! 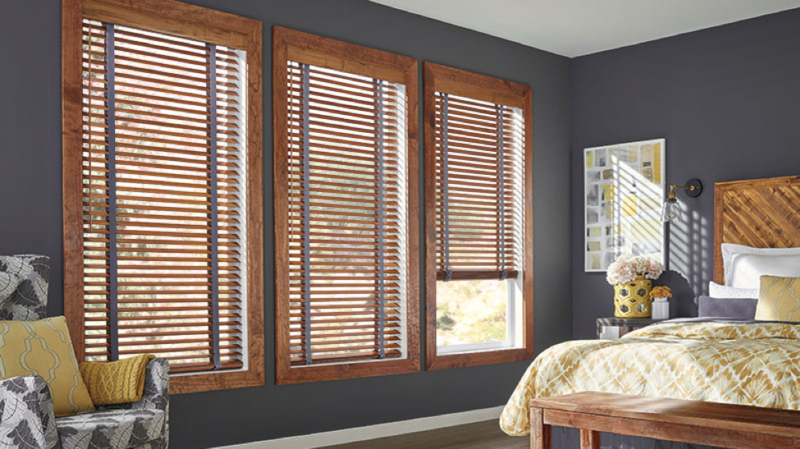 They have the look of luxurious real wood blinds at a price of about 15 to 25% less. Because faux wood blinds are made from a synthetic material (usually PVC or a polymer), they also offer easy maintenance and care. You won’t have to worry about warping, cracking, or splitting in environments of high moisture or high humidity, making this an ideal product for bathrooms, kitchens, garages, kid’s play areas, etc. Available in solid vinyl, or in a composition of vinyl and wood for added strength, faux wood blinds provide superior insulation. Wood blinds, on the other hand, offer a warm and inviting look to any decor. Wood has long been associated with strength and aesthetic beauty. Richly stained or painted wood blinds offer a wider selection of colors than faux wood, as well as other upgraded options and features. We often recommend real wood blinds when our clients need to match a particular wood stain or a custom paint trim color. Keep in mind that there is no comparison between faux stains and the rich beauty of a true wood stain, but we do carry wood grain-like options in our faux collections as well. Wood blinds are also an ideal choice for wider windows. Because of the lighter weight of real wood blinds, we can generally accommodate a wider window opening with a single blind. This is always a preferred choice over two blinds in one window opening! 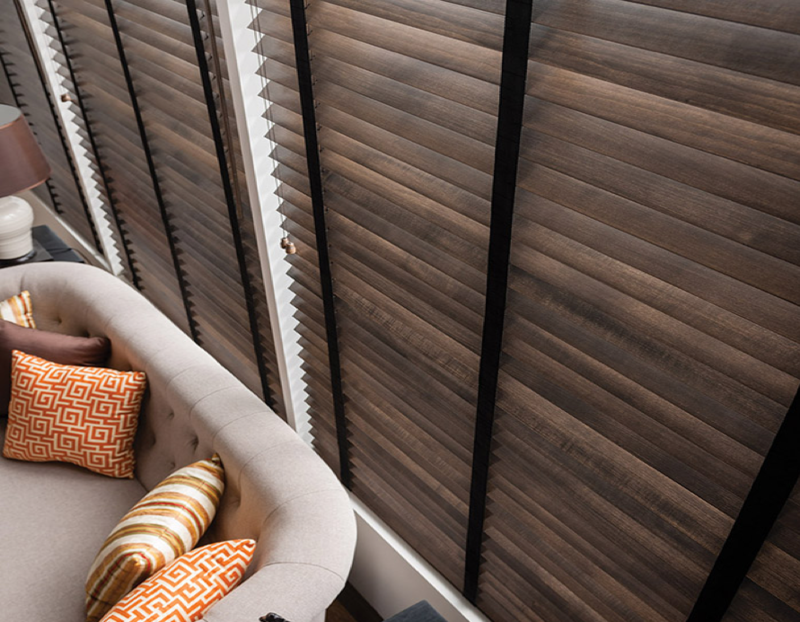 You can order your wood blinds with the popular no-holes option to stop light from leaking into your rooms or opt for decorative fabric tapes. Some of their wood blind collections are available with a motorized or cordless option, for ease of operation and child safety. Call them today at 306-280-0632 for your FREE in-home consultation! Check out their listing here in Saskatoon Window Coverings to read what their happy clients had to say...Made In the Shade are your Trusted Saskatoon Window coverings experts.